Yay! 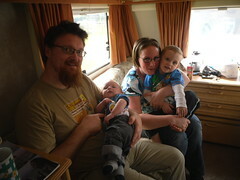 I finally have a photo of the 4 of us together. It's my 31st birthday today. It's not gone quite how we'd planned, but with my dad over that goes withour saying. Still... I have enjoyed trhe day so far, and I have an evening of Chinese food and new DVDs ahead of me, coupled with some new baking and crafting stuff to get creative with.